Sinkholes can cause major damage to buildings and personal property. These bizarre events occur in virtually all fifty states in the U.S. Some happen naturally while others are the result of human activity. Natural sinkholes are particularly common in Florida, Texas, Kentucky, Pennsylvania, Missouri, and Alabama. Sinkholes often occur without warning. In March of 2013, a giant sinkhole caused part of a Florida resort to collapse, sending guests fleeing. In 2014 a huge sinkhole opened beneath a vintage auto museum in Kentucky. Eight valuable cars fell into the void. Later that year a sinkhole suddenly appeared in a Chicago neighborhood, swallowing three vehicles. Natural sinkholes occur when bedrock is dissolved by water, causing the ground above it to collapse. The bedrock typically consists of carbonate rock, such as limestone or dolomite. Rocks that readily dissolve in water are called karst. A sinkhole forms when water falls onto an area composed of easily-dissolved rock and the water cannot drain out. Water absorbs carbon dioxide as it seeps through the soil. The carbon dioxide makes the water mildly acidic. The acidic water collects inside the rocks, which dissolve and create a depression. In some cases, the ground above a sinkhole collapses very slowly. In others, the ground collapses abruptly, causing a catastrophic failure of any structure that lies above. Sinkholes vary widely in size and shape. Some are shallow while others are very deep. Some are a few feet wide while others are acres across. Some sinkholes are bowl-shaped while others have steep sides. Some sinkholes are man-made. Situations that can trigger a man-made sinkhole include a water main break, removal or diversion of groundwater, collapse of an abandoned mine, and a collection of water on the ground surface. An enormous sinkhole in Louisiana was created when salt was removed from an underground salt deposit. Some sinkholes are triggered by drought, or by repeated fluctuations between drought and heavy rain. Both natural and man-made sinkholes can be caused by water or flooding that occurs after an extended period of dry weather. Nowadays, most small businesses that purchase commercial property policies choose "all-risk" policies. These policies cover loss or damage caused by any peril that is not specifically excluded. In most parts of the United States, sinkhole collapse is not an excluded peril. While they may not exclude sinkhole collapse, many property policies do contain a general collapse exclusion. This exclusion applies to property that abruptly falls down or caves in, loses its structural integrity, or cracks, bulges, or sags. The collapse exclusion in many policies contains an exception. This exception gives back coverage for the collapse of property that is caused by any of the specified causes of loss. 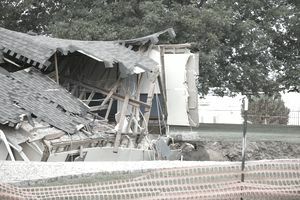 Sinkhole collapse is typically included as a specified cause of loss. Thus, the collapse of covered property caused by a sinkhole collapse is generally covered. Note that many commercial property policies, including the ISO policy, specifically define sinkhole collapse. This term means the sudden sinking or collapse of land into underground empty spaces created by the action of water on limestone or dolomite. Sinkhole collapse does not mean sinking or collapse of land into man-made underground cavities. In other words, the collapse of covered property is covered if the collapse is caused by a natural sinkhole. Collapse caused by a man-made sinkhole is not covered. If you live in an area that is highly prone to sinkholes, your property policy may contain a sinkhole exclusion. Some states (including Florida) require insurance companies to offer sinkhole coverage to policyholders for an additional premium. Unfortunately, this coverage can be very expensive. Florida law also requires insurers to provide coverage for catastrophic ground cover collapse. This coverage applies only if the ground cover collapses, leaving a clearly visible depression. In addition, the building must sustain foundation damage such that the building is condemned. A sinkhole collapse does not always cause a catastrophic ground cover collapse. Thus, if you operate a business in Florida and want protection against sinkhole damage, you need to buy sinkhole coverage.